Hearing loss is a leading birth defect among newborn babies, and updated technology at Hearing Professionals of Alabama is allowing audiologists to identify and diagnose hearing loss in a new way. Statistics show that between four to six newborns in every 1,000 have some degree of hearing loss, which can range from a mild hearing loss to profound deafness. To address this issue, most states, including Alabama, have mandated that all newborns receive a hearing screening prior to discharge from the hospital. Every infant who does not pass this initial screening or who is at risk for hearing loss must be referred for outpatient testing. Hearing Professionals of Alabama has become a new referral site for follow-up testing from newborn hearing screenings in East Alabama. Sedation or a patient being asleep and very still may be required in traditional testing methods to keep the infant in a still state in order to obtain accurate responses. 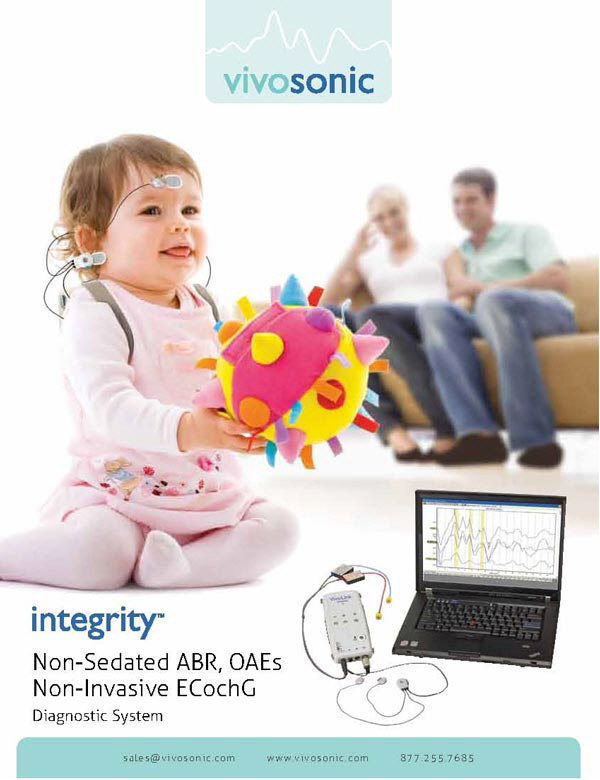 However, with our advanced equipment, auditory brainstem response (ABR) testing can be performed on an awake infant, child, or adult. Hearing Professionals of Alabama is the first facility in East Alabama to have this technology, known as a Vivosonic Integrity Auditory Brainstem Response (ABR) system. ABR testing has been used for several decades, but this particular system allows the audiologist to perform ABR testing for hearing assessment without sedation, making it ideal for testing children of all ages as well as other difficult-to-test populations. Patient can be awake and active (i.e. reading or playing with toys) during the test. This allows our audiologists to get complete and accurate test results easily, without repeated testing or referring them on for sedated testing. 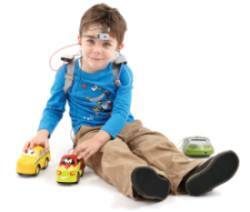 Research has shown that the critical development stage for speech and hearing is from birth to three years of age. This has led health professionals to adopt what is known as a “1-3-6” rule where infants are tested by one month of age, diagnosed by three months of age, and intervention begun by six months of age. Even with this information, many children can go undiagnosed for a long time. At Hearing Professionals of Alabama we have the luxury of taking the time to do what is needed. We are able to sit down and discuss the results with parents at the time of testing, which parents really appreciate. Once a hearing loss has been identified, Hearing Professionals of Alabama can provide the appropriate intervention including hearing aid fitting, other assistive listening devices, parent counseling and also make referrals for speech/language therapy. If you have questions about this test or need to make a referral, call our office (334) 521-7501. BiCROS is a great option for people with single-sided hearing. Check out this blog from a patient’s perspective. Call us at (334) 521-7501 if you have questions about the BiCROS or would like to know if it would be an appropriate option for your hearing loss. “Wearable technology” is something we are seeing more and more of these days. Popular wearables today are the Apple Watch, Google Glasses, Moto 360 or the Fitbit. A “wearable” refers to electronic technologies or computers that are incorporated into items of clothing and accessories which can comfortably be worn on the body. At a recent audiology conference we attended, the CEOs and executives of all of the major hearing aid manufacturers addressed the future, or next generation of hearing technology. Several of them mentioned “wearables” and creating devices that are more than just a hearing device. 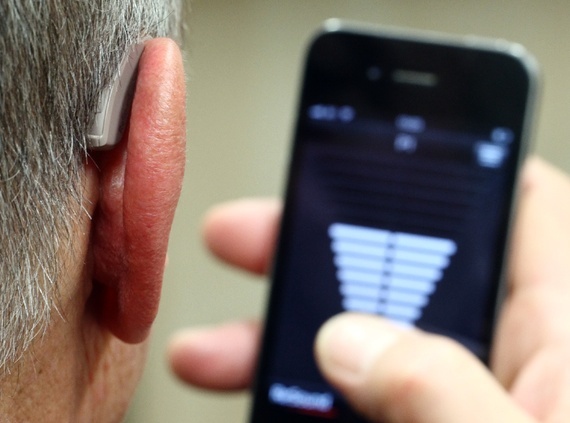 For some hearing aid manufacturers this “wearable” technology has already begun. For a while now, hearing aids have been able to data-log a patient’s daily listening environments and can indicate if a patient spent a majority of their time in noisy environments or in quiet environments. Hearing aids also have the capability to tell how many hours a day a patient wears their device. All data is important to the audiologist in order to make adjustments that will help the hearing aid perform better for the patient. It is interesting to think that hearing aids were definitely one of your first “wearables” long before the Fitbit and Apple Watch were invented! However, to be fair, hearing aids are quite different from the current array of consumer wearables. Hearing aids are medical devices designed to make up for a physical impairment. Consumer wearables like the Apple Watch are luxury items that let us read text messages and keep up with our daily fitness. This distinction has legal significance: The FDA tightly regulates any device that tries to either diagnose or treat a medical condition, which is why you can’t (or not supposed to) purchase hearing aids online, it must be dispensed through a licensed professional. 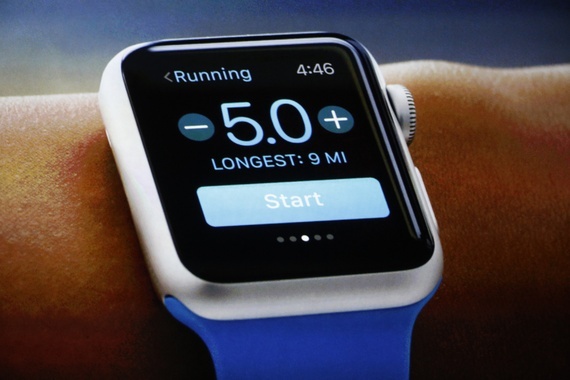 Both consumer and medical wearables share similar goals. These types of wearables aim to fill gaps in human capacity. Which if you think about it, all technology is assistive technology. While medical devices like hearing aids fill gaps created by disability or illness, consumer wearables fill gaps created by being human. Both kinds of wearables perform best when they are attached to our bodies. This seems pretty obvious for hearing aids, but it is just as true for consumer devices. Features of wearables works best when in close contact with your body for things like measuring heart rate. Also, both types of wearables need to embed themselves seamlessly into our experiences. If a wearable obstructs your experience of the real world, or is a distraction, it’s likely to end up in the drawer instead of in your ears or on your wrist. That’s not to say that hearing aids do not take getting used to—it still can take a patient several weeks to adjust to a new set of hearing devices. But after that period, a well-made wearable should seem like a seamless extension of our bodies. A man adjusts his hearing aid using his iPhone. Not only can a patient control their devices with their phones, they can now track their hearing aids on a map if they get lost, or create a special mode for their hearing aids to automatically adjust to when they geotag a certain location. The world a patient hears through hearing aids is a world interpreted and translated through millions of calculations a second. For hearing aids, that role is enhancing sound, replacing the too-soft sounds of the real world with louder, more comprehensible ones. But modern hearing aids don’t simply make everything louder; instead, they provide a substitute soundscape tailored to a patient’s needs and environment. When a patient walks into a loud restaurant, the devices can identify the clatter of glasses and the din of conversation, and tune out those sounds, while tuning into the sound of a nearby voice. The result is an audio experience that is substantially different from the objective reality; the device replaces a reality that would be challenging with a substitute that is easier to understand and utilize. All of this is done through millions of calculations a second of a mini microchip that is small enough to house in something as small as your ear canal. So, the next time you see a person with hearing aids, think about it as a new type of wearable- even though it was actually one of the FIRSTS! Want to see the new hearing aid wearables in person and see the new things they can do? Contact one of our audiologists (334) 521-7501. For more on wearables and hearing aids, see the Atlantic. February 2-8, 2015 is National Tinnitus Awareness Week! Have you ever gone to a concert and your ears continued to ring long after the concert was over? The ringing eventually goes away. But what if it didn’t? Approximately 50 million Americans have permanent tinnitus or ringing in the ears. In fact, tinnitus is the most common service-connected disability for Veterans. The majority of our patients report experiencing some level of tinnitus on an everyday basis, some cases more severe than others. If you experience tinnitus, know that you are not alone and there are ways to cope with it! Tinnitus, pronounced /ˈtɪnɪtəs/ or /tɪˈnaɪtəs/, is a ringing, buzzing, clicking, roaring, or rushing sound in the ears. Tinnitus is not a disease, but instead a result of some other condition like hearing loss from noise, exposure to explosions, hearing loss from age, infections in the ears or sinuses, head or neck injuries, cardiovascular problems, stress or anxiety, or certain medications. There is no cure for tinnitus but treatment options are available to help patients cope. Hearing aids and Tinnitus Treatment Devices can be used for individuals with tinnitus and hearing loss. Hearing aids and tinnitus devices allow you to hear better and may make the tinnitus less noticeable. Sound generators or Tinnitus Maskers can be used to help you relax or fall asleep. Sound generators produce soothing, repetitive, sounds. Some sound generators can be worn in the ear and resemble a hearing aid in appearance. Tinnitus Retraining Therapy can help you manage tinnitus by changing the way you react when you hear the ringing. One of the goals of counseling is to make the tinnitus less bothersome. Many people experience tinnitus now and then but there are factors that can increase your risk. Loud noise exposure. Exposure to loud noise can damage delicate structures of the ear. It is important to protect your hearing with ear plugs when exposed to loud sounds. High blood pressure. Health conditions, such as high blood pressure or narrowing of the arteries, can increase your risk of tinnitus. Gender. Men are more likely to experience tinnitus than women. Smoking. Smokers have a higher risk of tinnitus. If you think you have tinnitus, contact our audiologists (334) 521-7501 for an evaluation and to learn more about your treatment options. Information courtesy of Guard Your Health. For more information, visit the American Tinnitus Association website. Noise…. it’s typically everywhere we go. From a screaming child (maybe it’s yours… but we won’t tell! ), to dogs barking, to music blaring, or perhaps airplanes flying overhead. Noise is part of our lives. Most of us are more than likely accustomed to some level of noise in our daily routines, but we may not think about the damage it can cause to our hearing. 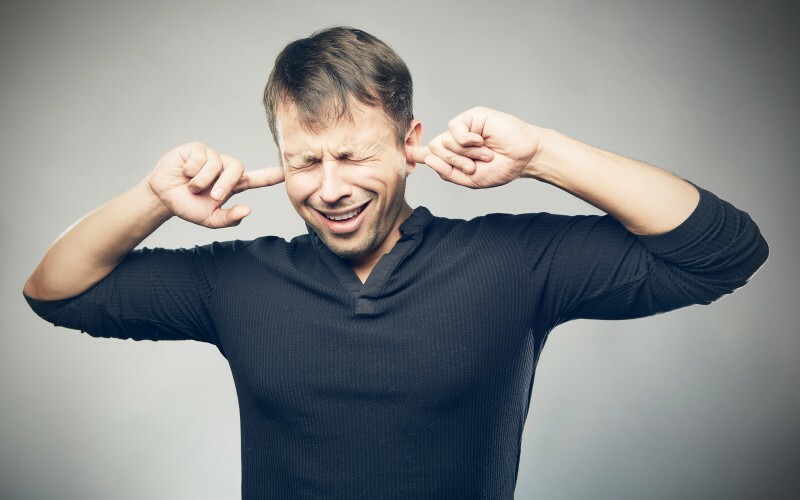 Noise Induced Hearing Loss (NIHL) results from damage to structures and/or nerve fibers in the inner ear, and is caused by exposure to excessively loud sounds. NIHL can result from a one-time exposure to a very loud sound, blast, or impulse, or from listening to sounds for an extended period of time. Check out this video: How Does Hearing Loss Occur? There have been a number of studies recently linking NIHL to sound machines. As parents, we tend to latch on to ANYTHING that will work to gain a few glorious hours of sleep with newborns; however, if that one thing is a sound machine, be aware of the potential damage it could cause. This article provides some additional insight and research on the topic. The biggest message…. Use in Moderation! No… We aren’t talking about the T.V. show! We are talking about the maximum amount of time that you/your children/your grandchildren should listen to music through earbuds in one sitting. With the accessibility of music today being at an all time high, this leads to an increase in the risk of noise induced hearing loss in those that frequently listen to music through their handheld devices. It is recommended that people listen through earbuds at 60% volume for no more than 60 minutes at a time. Another good rule of thumb is that if anyone else around you can hear your music through your earbuds… IT’S TOO LOUD! Thanks to industry standards set by Occupational Safety and Health Administration (OSHA) NIHL caused by noise exposure in the workplace has drastically decreased in recent decades. There are now requirements for proper use of hearing protection in areas that reach certain decibel levels. These regulations have saved numerous industry employees from the hazardous effects of noise. Bottom Line… If you question whether it’s too loud… it probably is!! If you, or someone you love, is experiencing difficulty hearing give one of our Audiologists a call at (334) 521-7501. Are you a parent of a teenager that doesn’t seem to hear you? Consider scheduling a hearing health evaluation! 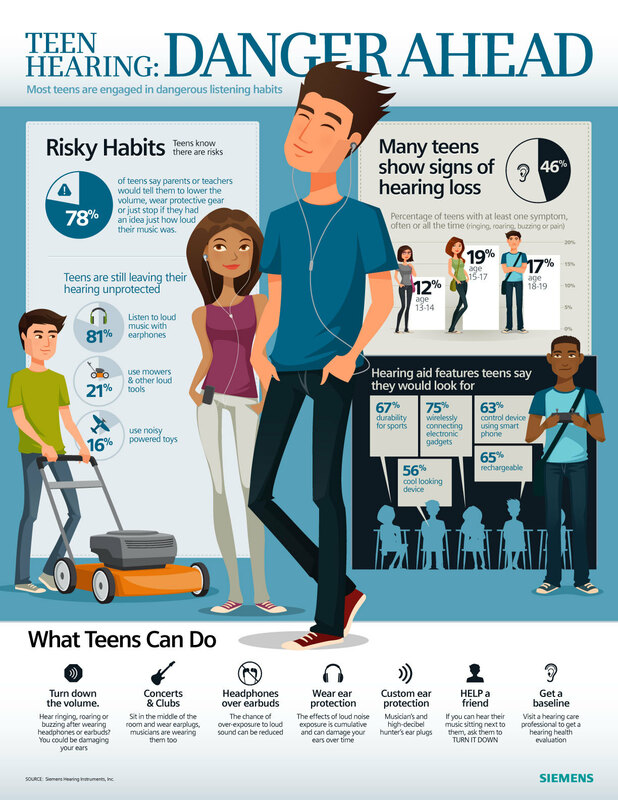 Studies are showing that nearly half of teenagers are showing signs of potential hearing loss! Hearing loss in teenagers can affect performance in school, and affect social interaction with peers and communication with family members. Hear ringing, roaring, or buzzing after wearing headphones or earbuds? You could be damaging your ears. At a concert or loud event? Sit in the middle of the room and wear earplugs, musicians are wearing them too. The chance of over-exposure to loud sound can be reduced wearing headphones vs earbuds. Check out these stylish Puro headphones that were designed with hearing health in mind! Concerned about your teenager’s hearing, or just want to have it checked? Don’t Let Hearing Loss Keep You From Achieving Your Dreams! Since this commercial aired, the awareness of hearing loss has spread like wildfire! In fact, upon hearing his story, two courageous young girls with hearing loss came forward to write a letter to Derrick Coleman. True to form, he responded, thanking them for their bravery and support! Their heartfelt letter sparked even more nationwide media attention. Days before last year’s big game, the hearing instrument organization, Oticon, invited these girls to pre-game media events. The girls even supported their team wearing their blue-and-green hearing aids! The Seahawks won the Super Bowl in 2014. That’s quite an accomplishment! Seattle’s home games have been measured to get up to 136 dB of volume. That’s some LOUD and proud support! (So… if you happen to go to a game, you may just want to bring along some earplugs – you’ll be glad that you did). Thank goodness for people like Derrick Coleman! Because of his ability to tell his story, we as a society can become more educated on hearing loss and its effects. There needs to be better appreciation of the unique sets of challenges that hearing-impaired people face every single day. If you have hearing loss, don’t let it stand in the way of your dreams! Hearing loss shouldn’t hinder anyone from living the life that they want to live! Just ask Derrick Coleman.